The Bowl is very deep. Does it collect debris? The high rim of the bucket reduces the chance of a cow lifting feed into the bucket. The KZS-07 is also self cleaning. The high flow valve scours the bottom of the bowl to keep it clean. The high flow also keeps small particles of feed suspended in the water so that they are swallowed by the cow. Some farmers observed long hay in the Zero Spill but then when they went to remove it, it was already gone. They assumed that the cow picked it out and ate it. Seventy percent of the farms that were surveyed reported that the Zero Spill waterbowl remained cleaner than the traditional waterbowl that they had replaced. Every farm will have unique results because of their feeding program, stall design and mounting location. Farmers suggest that the higher that the waterbowl is mounted, the less debris is collected. The most common comment from farmers is that small amounts of long hay need to be removed occasionally. The most positive comment was from a farmer who had 6 Zero Spill waterbowls in for 6 months and he had never even seen a scrap of hay to be cleaned out. He regularly needed to remove hay from under the paddles of his other waterbowls. The most negative comment was from a farmer that noticed more hay to be removed than his old delaval waterbowls. He said that the cows would keep the shallow waterbowls clean by splashing the debris out along with the water. He believed that the inconvenience of picking the long hay out of the waterbowls occasionally was certainly less than cleaning wet hay out of the mangers daily. Customer Service: When you call for information you can talk to the farmer who invented the Zero Spill, toll free at 1-866-482-3367. Will it fit on my stalls? Is it too big for my stalls? KZS-07 requires a minimum of 4" of clearance above rim for a total of 16". KZS-13 requires a minimum of 16" of clearance for a total of 26". Traditional rigid waterbowls are shallow to allow maximum space above the bowl for a cow to fit her head. 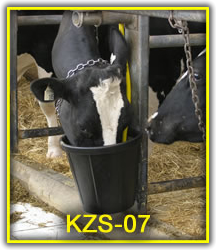 If the 12” deep Kendu Zero Spill waterbowl was rigid, most stalls designs would not have sufficient headroom to let the cow access her water. So constructing the bucket with a flexible rubber compound allows the cow to flex the entire bucket towards them as they put their muzzle into the bucket. Essentially the cow has her own personal waterbowl on her side of the stall so there are no stall dividers to get in the way. When she finishes her drink the waterbowl goes back to the original centre position where both cows can have access. 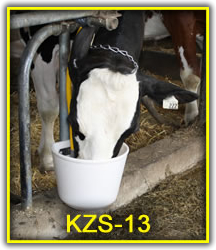 This allows the Zero Spill waterbowl to be even more accessible for a cow than traditional shallow waterbowls. The flexible waterbowl will improve the comfort of cows when they are drinking and can even be used in tight spaces where rigid waterbowls will not work. If you improve the comfort for a cow when drinking she will likely take a few more drinks than usual in a day. See images at left.